Israeli Prime Minister Benjamin Netanyahu's wife Sara, here seen with the premier in August, has taken a polygraph test over graft claims. JERUSALEM - Israeli Prime Minister Benjamin Netanyahu's wife has taken a voluntary lie detector test to try and dispel allegations she misused public funds, her lawyer said on Sunday. 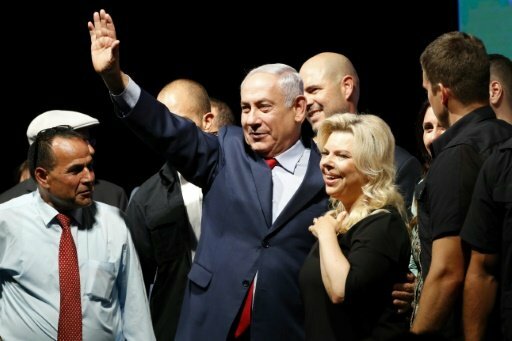 National fraud squad detectives questioned Sara Netanyahu last month on suspicions she routinely claimed state payments for personal housekeeping expenses at the couple's official and private residences. Private broadcaster Channel Two reported at the weekend that the attorney general was expected to announce charges against her by September 10. "She took the test," Netanyahu family lawyer Yossi Cohen told Israeli public radio. "It's a very tough test. It's humiliating and she did it wonderfully." He did not give details of the questions she was asked or the test results. He said the decision to undergo the examination, at a privately operated polygraph facility, was taken "following the horrible mudslinging against her and after we heard that she is going to be put on trial". Netanyahu himself is also under investigation on suspicions of corruption, and last month his former chief of staff signed a deal to turn state's witness in probes involving the premier. One is based on suspicions Netanyahu unlawfully received gifts from wealthy supporters, including Australian billionaire James Packer and Hollywood producer Arnon Milchan. Also under investigation is a suspicion that Netanyahu sought a secret deal with the publisher of top-selling daily Yediot Aharonot. The proposed deal, which is not believed to have been finalised, would have seen Netanyahu receive positive coverage in return for him helping to scale down the operations of Israel Hayom, Yediot's main competitor. The investigations have have stirred Israeli politics and led to speculation over whether Netanyahu will eventually be forced to step down, which he is not formally obliged to do unless convicted.